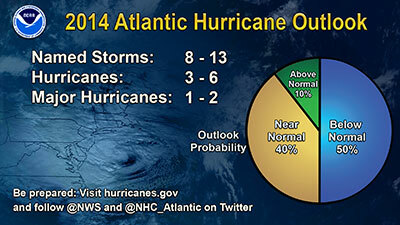 With just over a week to go until the start of the 2014 Atlantic hurricane season, NOAAÃ¢â‚¬â„¢s outlookÃ‚ is hot off the press and garnering a lot of attention. Ã¢–  NOAA is calling for a 50 percent chance of a below-normal season, a 40 percent chance of a near-normal season, and only a 10 percent chance of an above-normal season. Ã¢–  NOAA predicts a 70 percent likelihood of 8 to 13 named storms (winds of 39 mph or higher), of which 3 to 6 could become hurricanes (winds of 74 mph or higher), including 1 to 2 major hurricanes (Category 3, 4 or 5; winds of 111 mph or higher). Ã¢–  These numbers are near or below the seasonal averages of 12 named storms, six hurricanes and three major hurricanes, based on the average from 1981 to 2010. What are the reasons behind NOAAÃ¢â‚¬â„¢s predictions for a near-normal or below-normal season? A key driver of this yearÃ¢â‚¬â„¢s outlook is the anticipated development of El NiÃƒ ±o this summer that is expected to cause stronger wind shear which reduces the number and intensity of tropical storms and hurricanes. Note: NOAAÃ¢â‚¬â„¢s seasonal hurricane outlook is not a hurricane landfall forecast and does not predict how many storms will hit land or where a storm will strike. For a round-up of the latest predictions from the major hurricane forecasters check out this post at Dr. Jeff MastersÃ¢â‚¬â„¢ Wunderblog.